[Seoul] Where do I start? 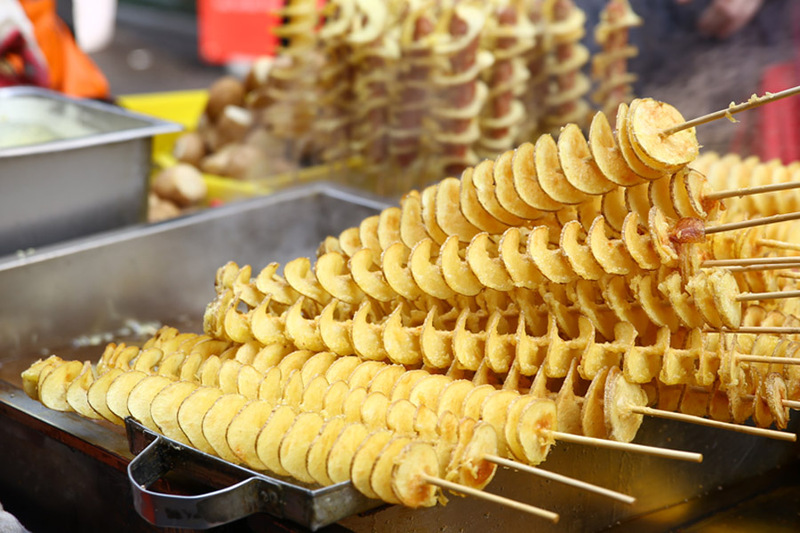 South Korea is the land of appetising and affordable street food, that you can find at markets, subway stations and from ‘pojangmacha’ – street carts along popular areas. During my last visit, I realised that the number of street food stalls along the key Meyongdong Shopping Street have increased, and there could be at least 80 of them as I walked from one end to another. I made it a point to try 3 or 4 different ones in the 2 weeks I am there, and surprised to find THIS variety. Some tips: Prepare change fast, most food items should average about 2,000 – 5,000 Won (SGD2.40 to SGD6.00). Bring a waste paper bag along for disposal as the major trash bag points are not that easy to find (and I saw tourists just leaving trash everywhere, so let’s be more responsible to keep the city clean). 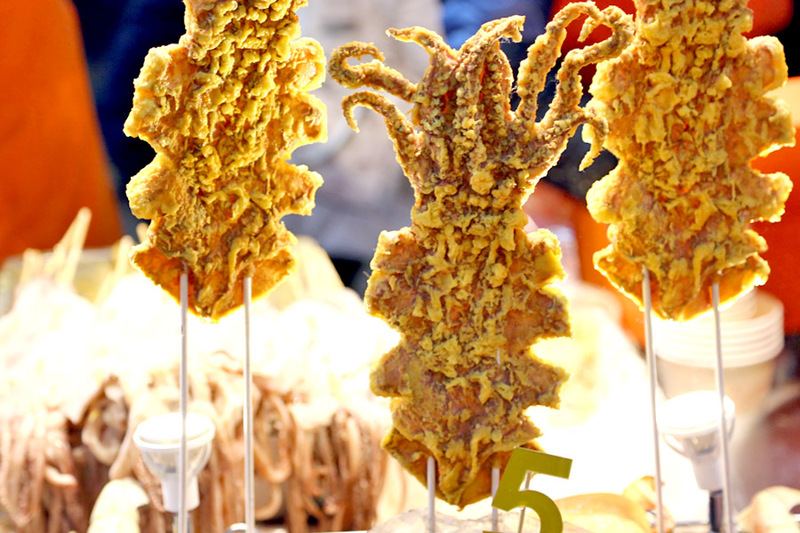 Many stalls provide an English menu, and some owners were proficient in Mandarin. Note: I only covered 50, but there were many more. Stalls could change location, or serve varied items depending on the season. 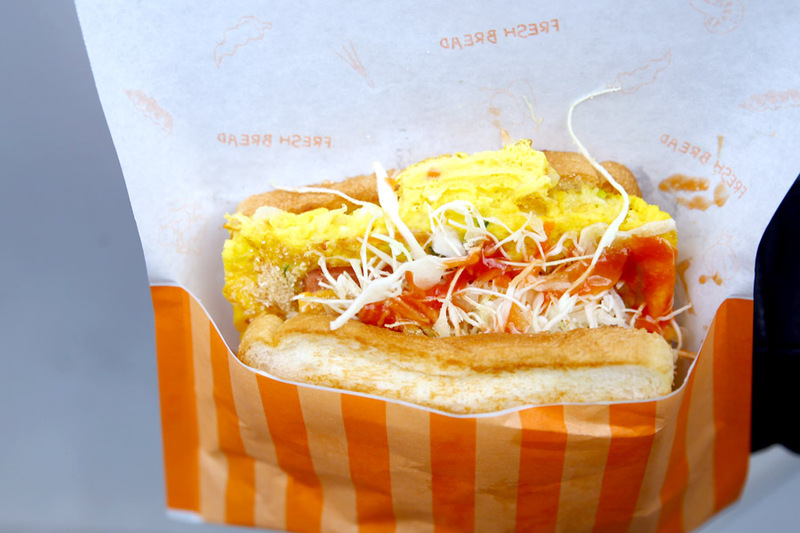 50 Best Korean Street Food At Myeongdong. Seoul Delicious, Seoul Daebak! 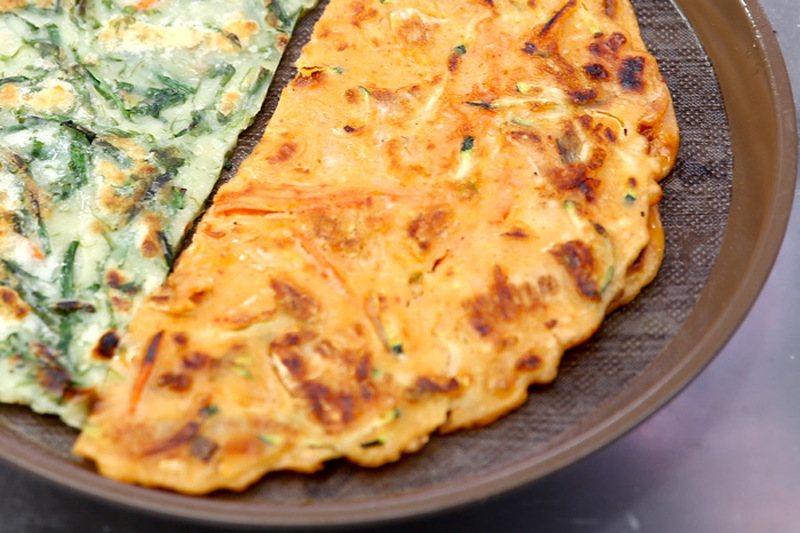 (Click PLAY for the video of the making of a Korean Street Toast. Street food goes upmarket. 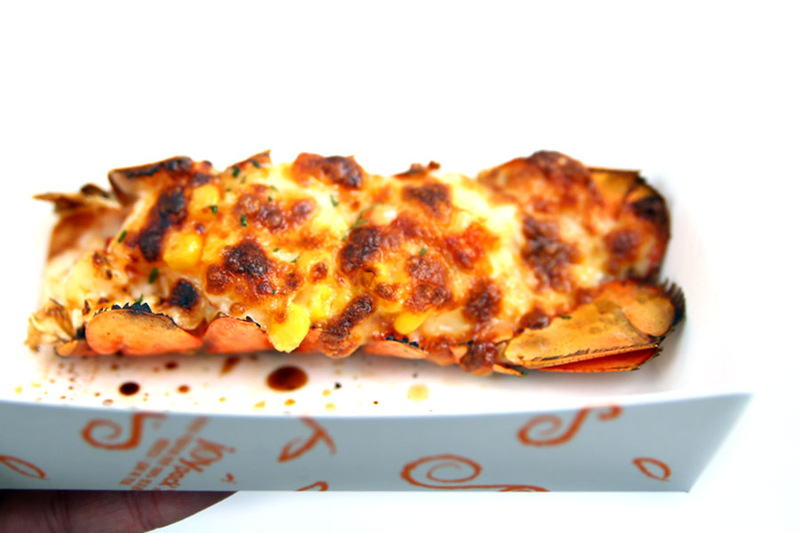 New York has lobster rolls, Seoul has grilled cheese lobsters. Quite an indulgent snack at 15,000 Won (SGD$18.00). If cost is not a major factor, I thought it was quite worth it as the seafood was so fresh and sweet. 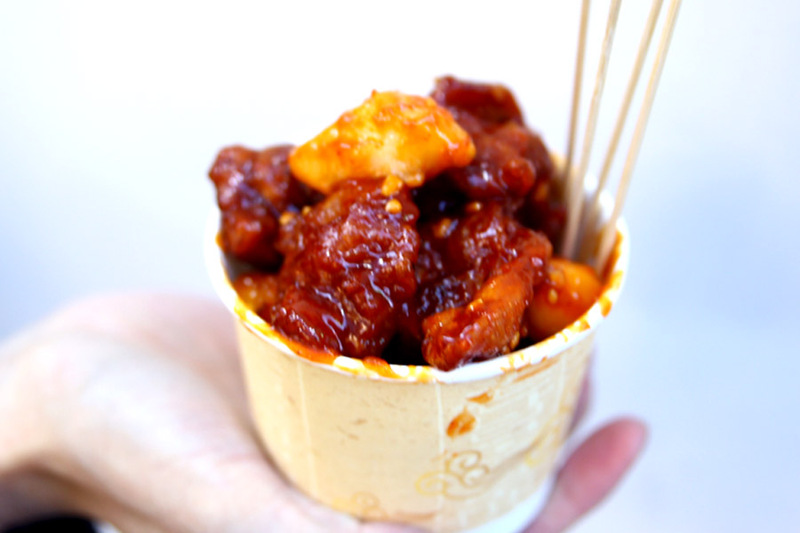 Also known as teokbokki, ddeokbokki, topokki, these are cylinder-shaped rice cakes cooked in gochujang – a sweet, spicy red pepper sauce. 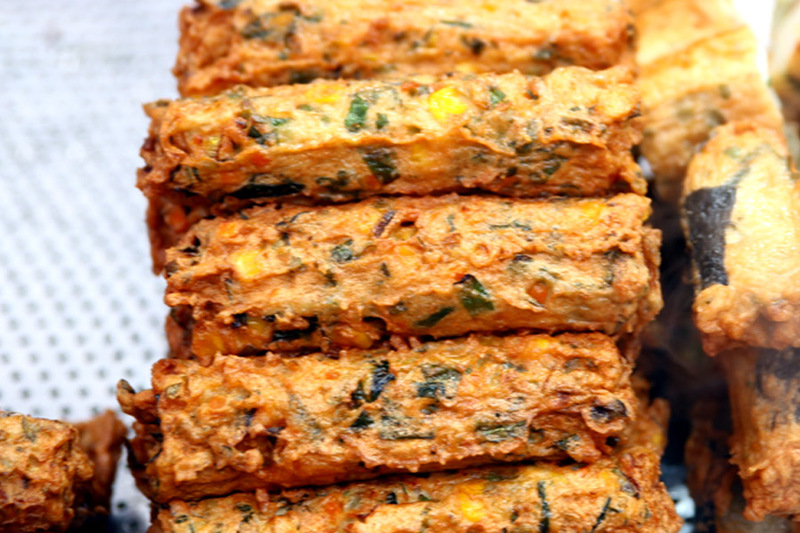 Can be served in a bowl with ingredients such as egg, noodles or cheese, or in a stick. 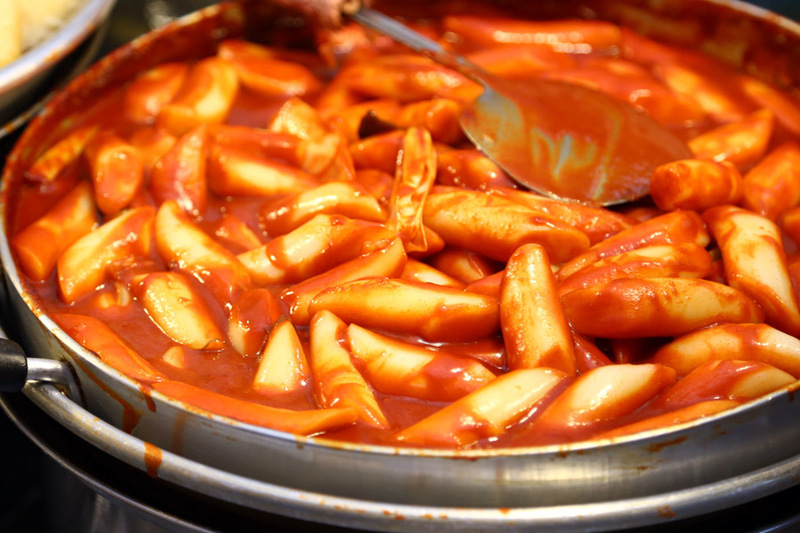 You almost find Tteokbokki EVERYWHERE. These are fishcake on skewers served with hot broth. 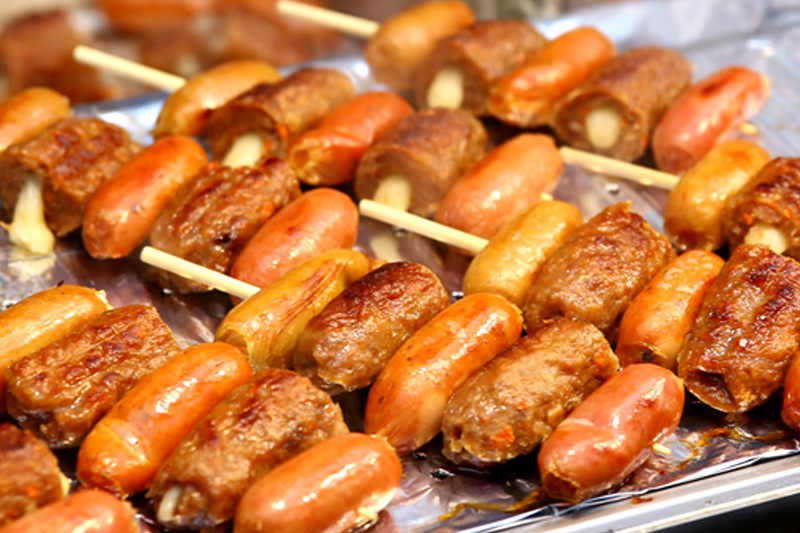 Best to have these skewers during the cold weather when you can keep warm by holding a cup or bowl in your hands. 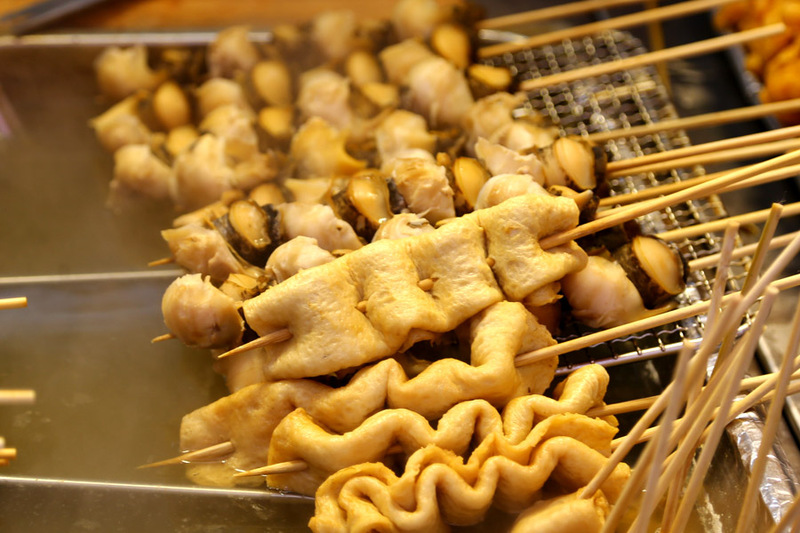 Note: “Odeng” is derived from the Japanese word of “Oden”, while “Eomuk” is the native Korean word. “Tang” refers to soup. 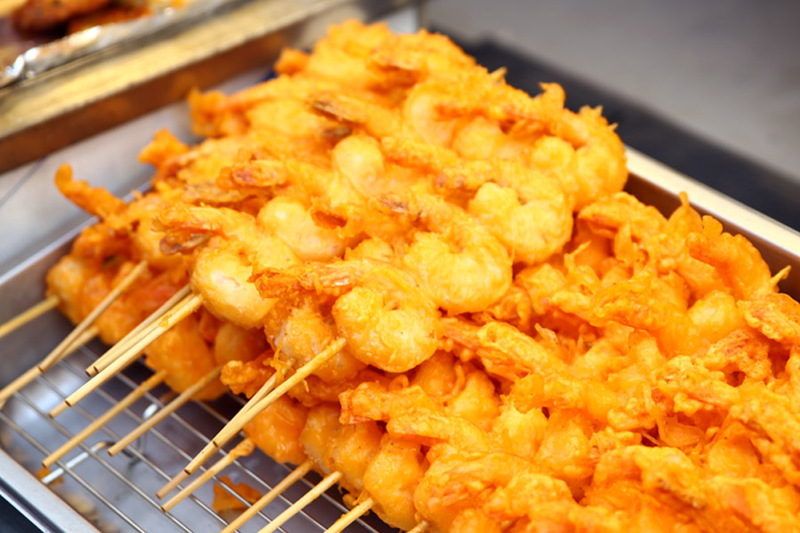 The rectangular seafood skewer is typically made of ground white fish and other ingredients such as potato starch, sugar and vegetables, then deep fried. I liked those with some vegetables for the crunch. 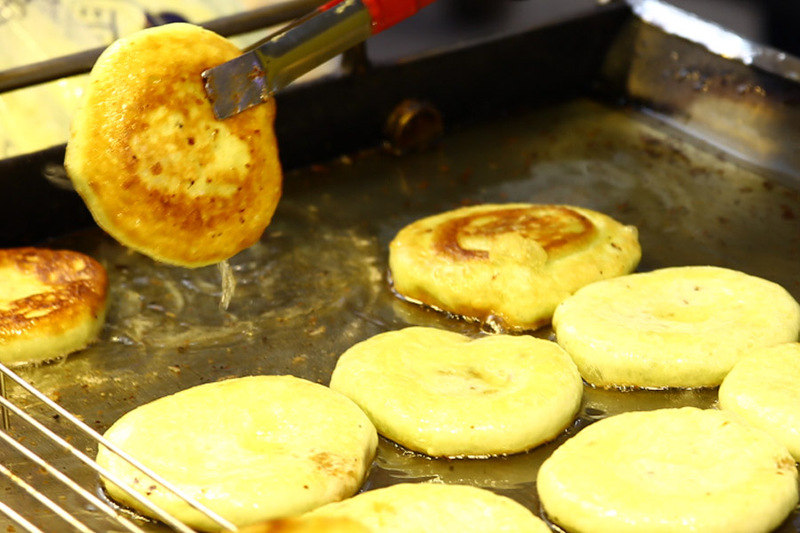 Pronounced ‘ho-tok’, these are sweet pancakes with brown sugar syrup filling. 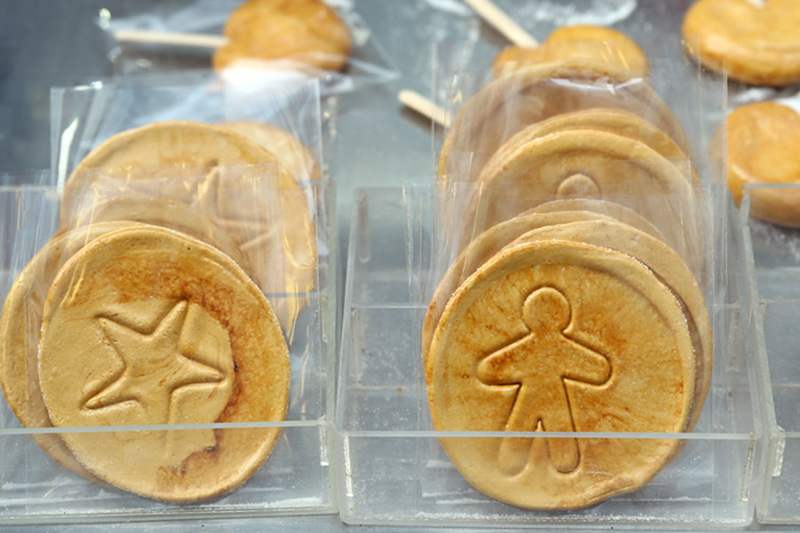 A type Korean candy made with caramelised sugar and some baking soda. They can be found with cute with imprinted shapes from hearts to stars, typically made by a ‘ajumma’ sitting on a stool in Myeongdong. 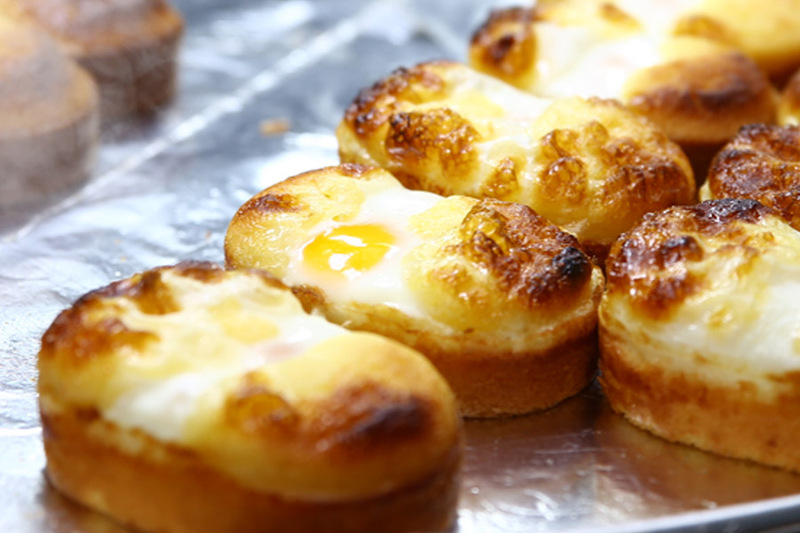 Steamed little loaves of bread with a whole egg inside, and they usually taste both sweet and fluffy. Some stalls are (much) better than the others. Spiral-cut potato. Amazing to see how a single potato is cut to a long stick (by a machine). Some stalls offer seasoned powders to sprinkle over such as onion, cheese or BBQ. Fanciful stuff. Used to be much more popular, till it became too common. The same Tornado Potato with a sausage inside. What?! If you love your calamari, wait till you see this. A giant squid deep fried. 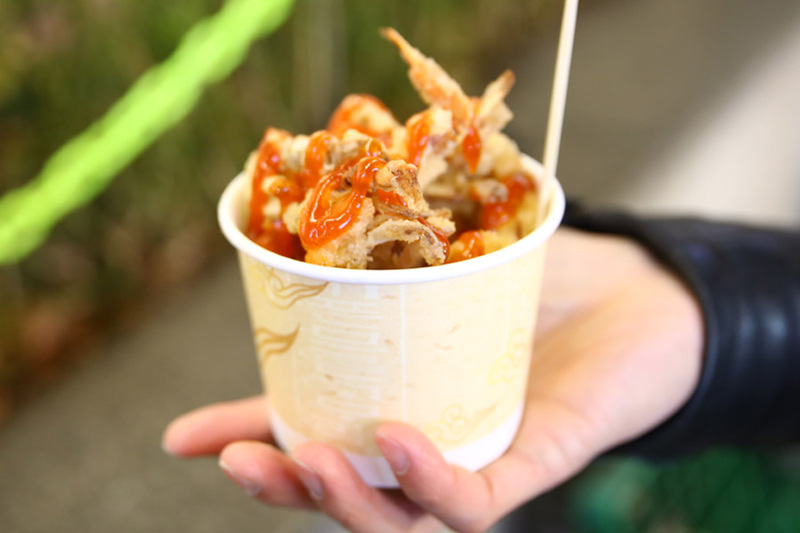 Typically, the squid will be chopped into pieces and served in a disposable box, sprinkled with a salty powder. Though you can also chew the thing in its entirety. Savage. 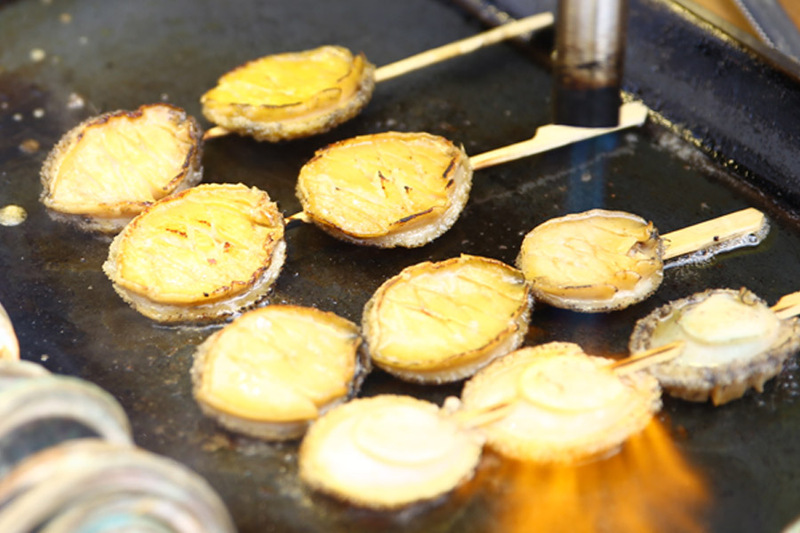 Some are freshly grilled on the spot, either than a machine or stove. Amazing to watch how they are made on the spot. Surprisingly, I like these Korean ones as they are chewy yet soft, and you do not need to work on your teeth that much. 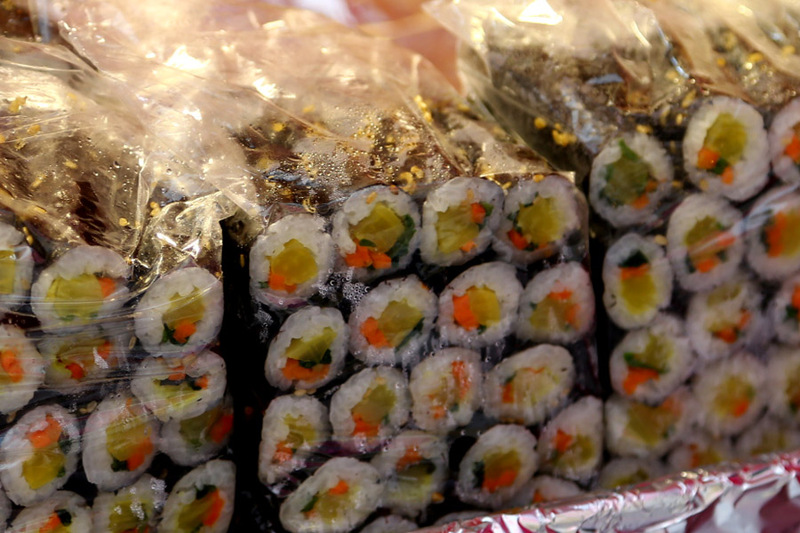 Gimbap or kimbap is like a sushi roll, made from steamed white rice (bap) and various other ingredients such as vegetables and pickles, rolled in gim and served in bite-size slice. The Korean street version is usually pre-made and wrapped in plastic. 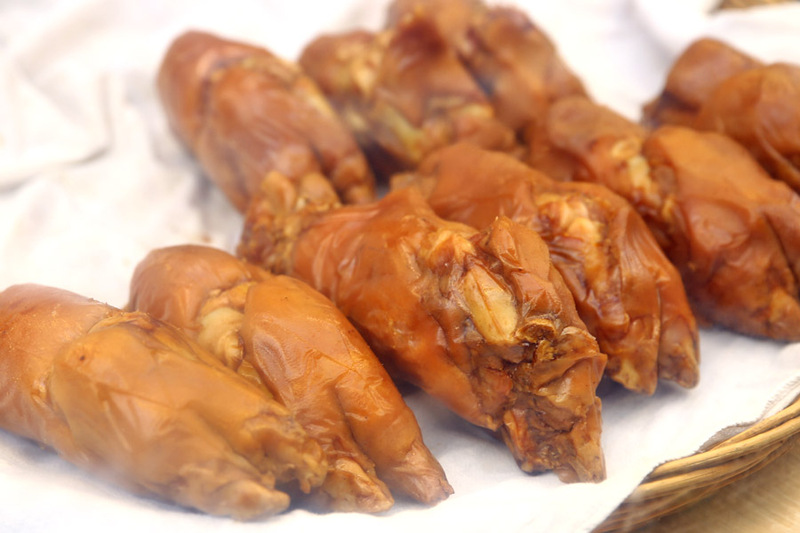 Double-deep fried chicken pieces further tossed in sticky sauces, from sweet and spicy ones, to soy and garlic. 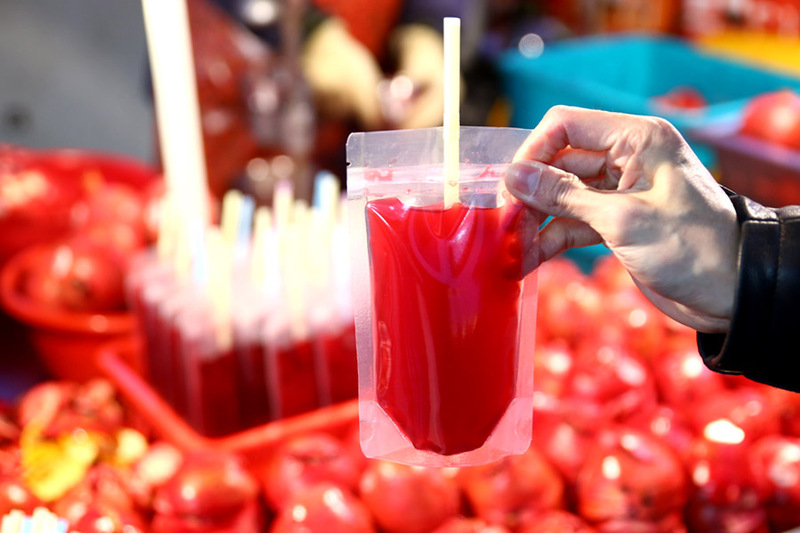 A stick typically goes for 3,000 Won (SGD$3.60) while a more fulfilling cup is at 5,000 Won (SGD$6). 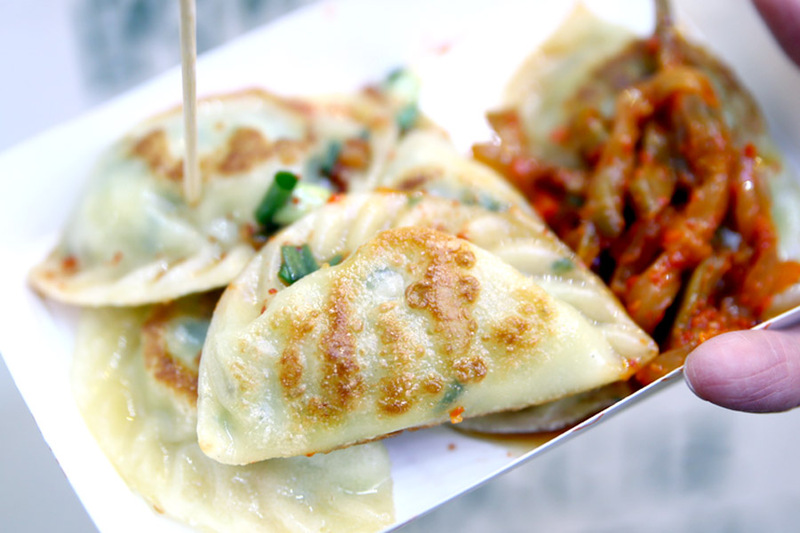 Mandu refers to a stuffed dumpling, similar to the Chinese jiaozi and Japanese gyoza. 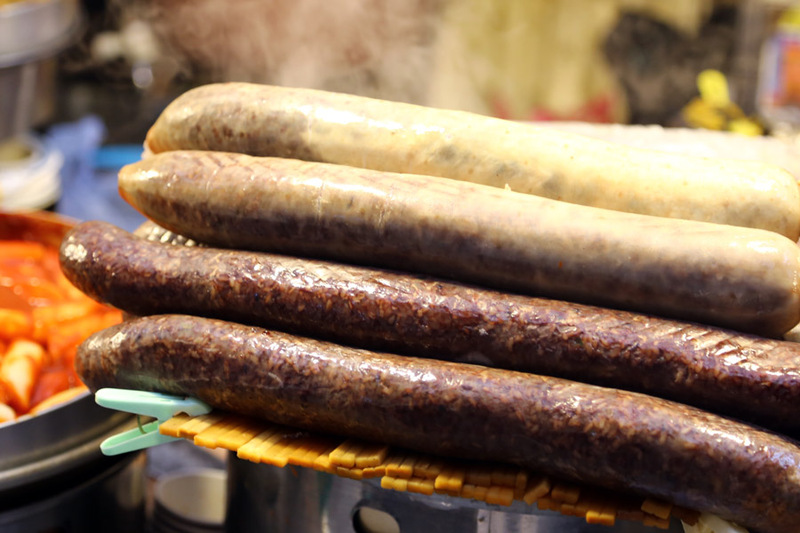 When are they steamed, they are known as “jjinmandu”. 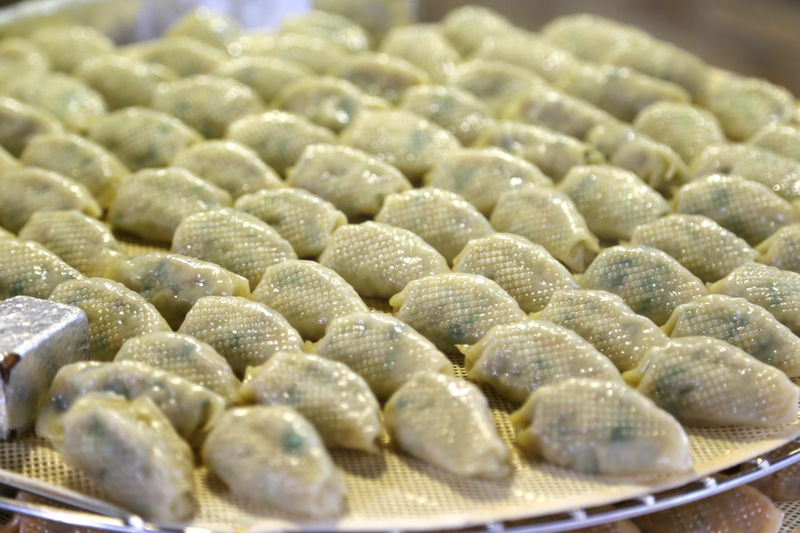 Meat and vegetables-filled dumplings pan-fried till crisp, juicy on the inside. Sometimes further served with kimchi in a box. Deep fried crispy baby crabs. 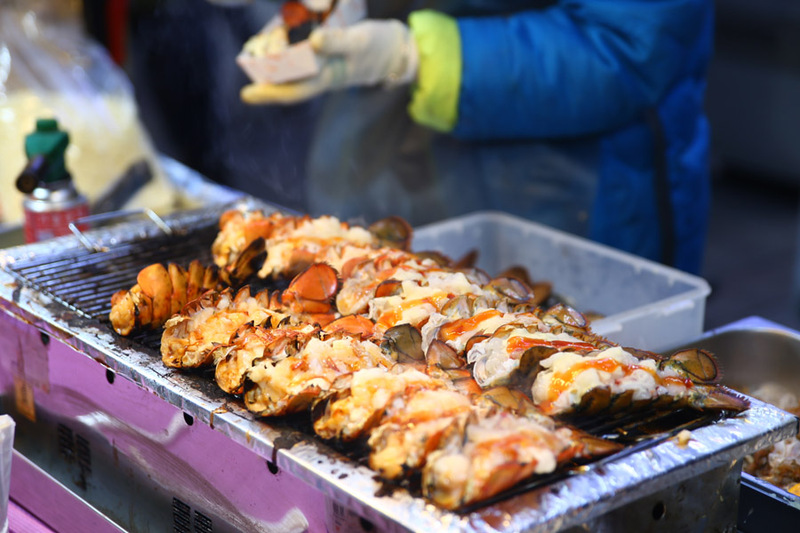 I had expected them to taste like the Japanese’s Kanikko snack, but these crabs had a softer body like soft shell crabs. 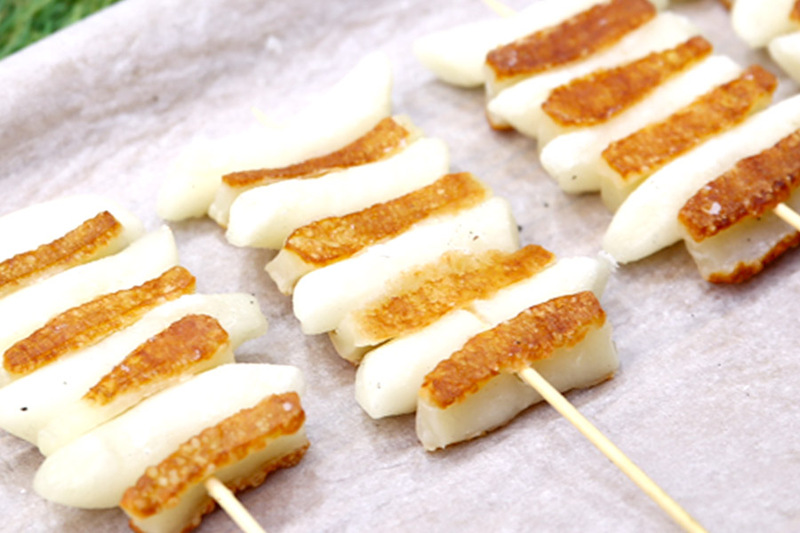 (Don’t quite understand the fascination of this…) Skewered sticks of rice cakes and alternating pieces of mozzarella cheese grilled. 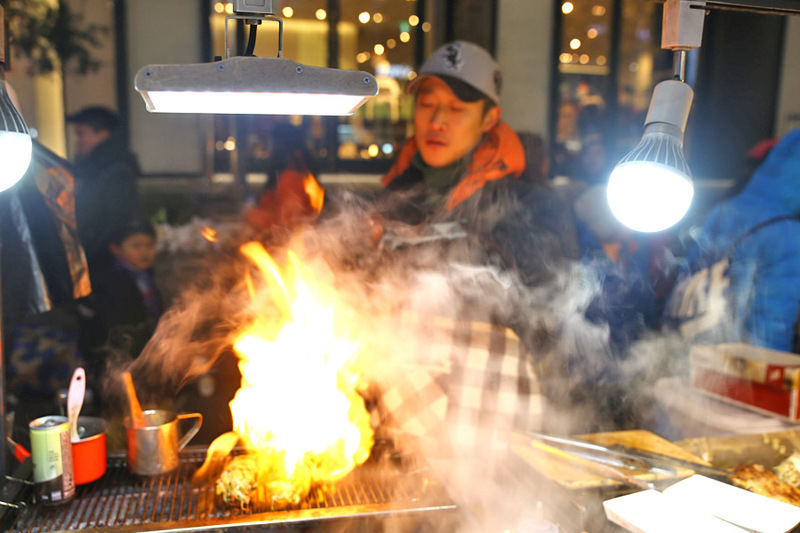 The street stalls at Myeongdong are full of flaming torches. 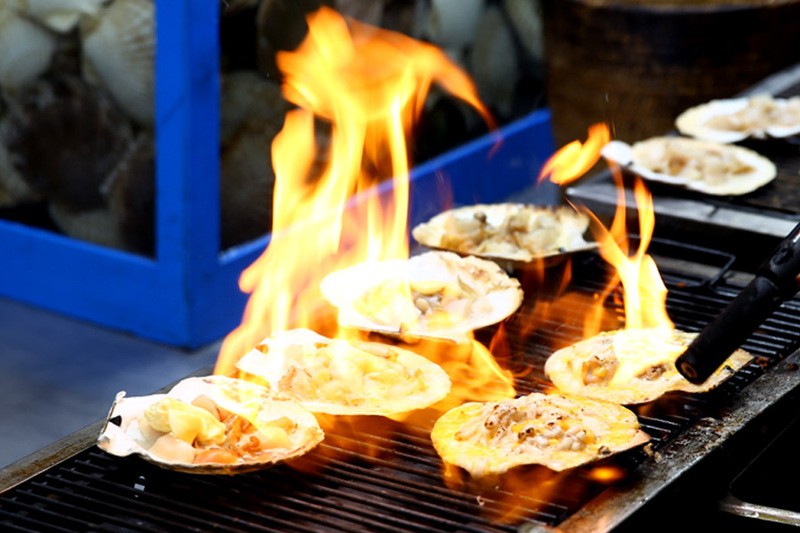 Grilled scallops added with mozzarella and cheddar then torched. 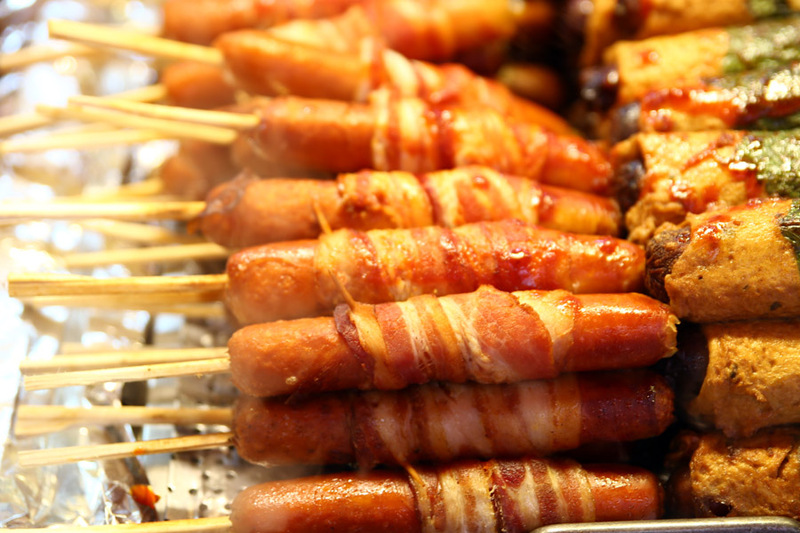 Vegetables such as shredded carrots, bean sprouts and onions wrapped within a thinly sliced pork belly and pan-fried. Some tourists were trying to make a guess what this is. Pork trotters, braised in a combination of soy sauce, ginger, garlic. Worry not, they look much better sliced. Greasy, but delicious. Pan-fried Korean noodles with bite-sized pork, shredded cabbage, onions and carrots, with some gochujang sauce for the spiciness. 4,000 Won (SGD$4.80). 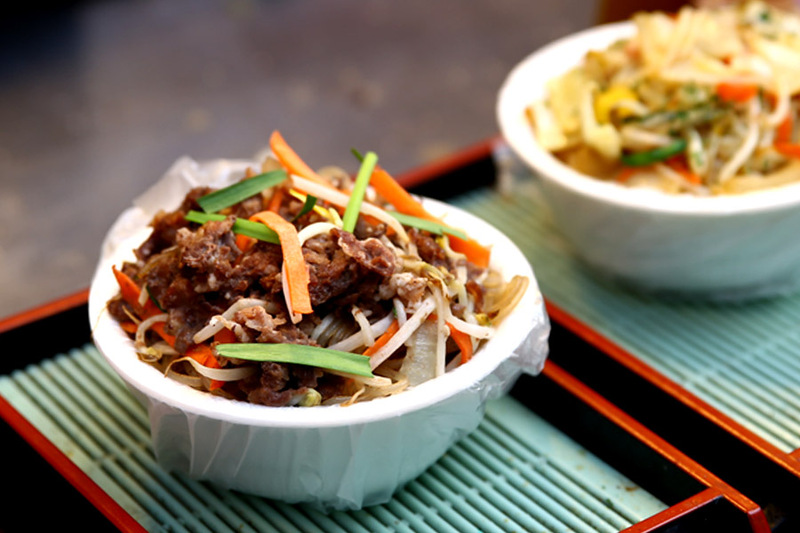 Korean stir fried beef noodles with vegetables. 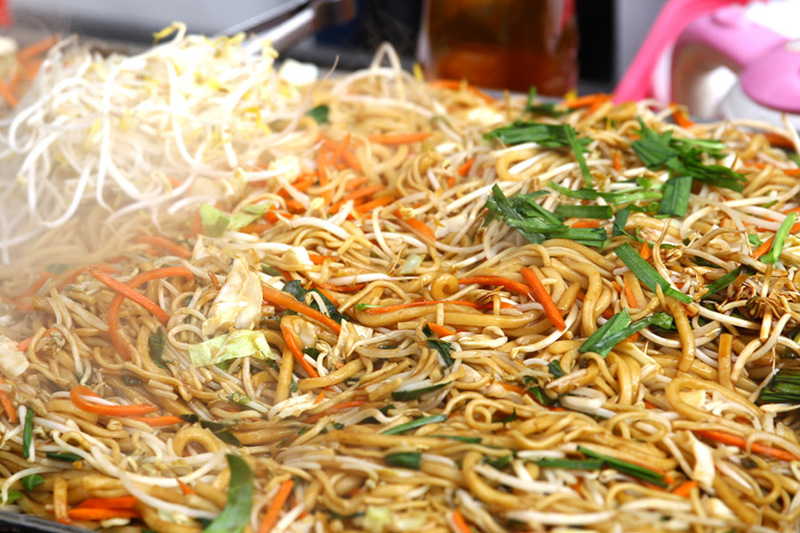 Japchae is a type of Korean glass sweet potato noodles, stir fried in sesame oil with vegetables, flavoured with soy sauce, and sweetened with sugar. 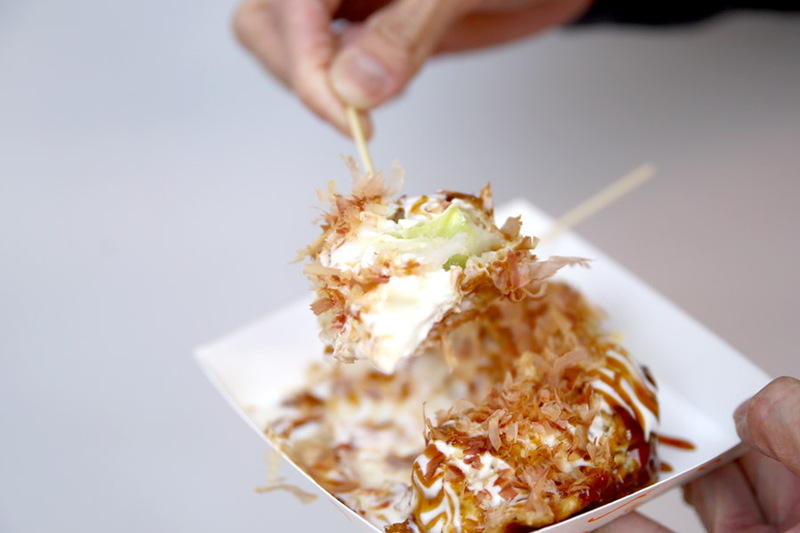 Almost like a Takoyaki (wheat flour-based batter and cooked in a special moulded pan) though shaped like a mini-pancake, choose your fillings of shrimps, octopus or bacon. 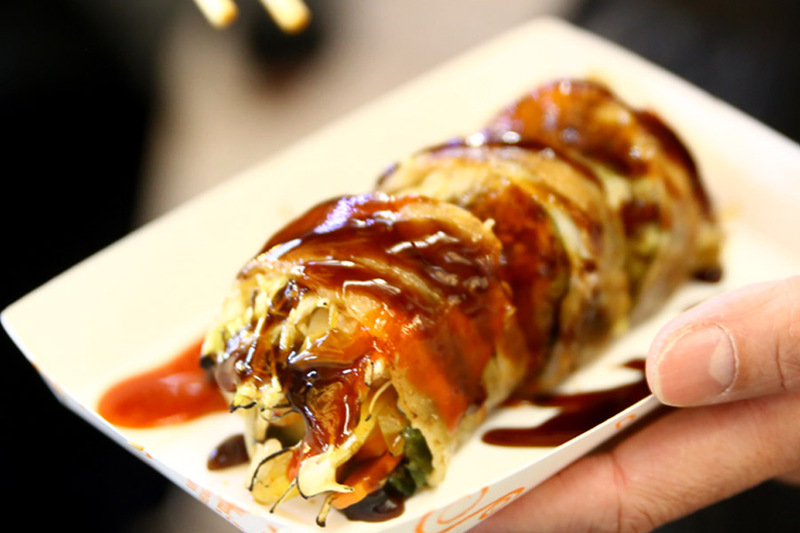 Sprinkled with bonito flakes and drizzled with mayo and sweet sauce before serving. Tteokgalbi is a classic Korean dish made from beef ribs. 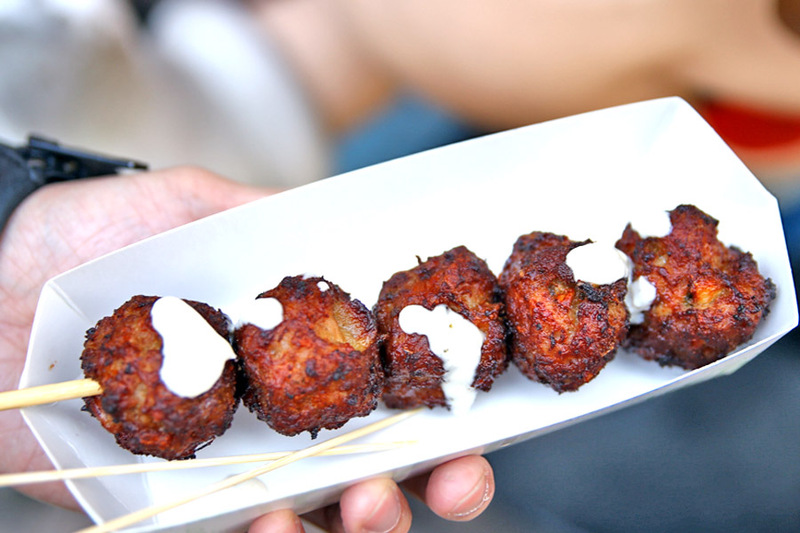 The meat is minced and pounded on the bone, marinated in a sweet savoury sauce, then rolled into balls then deep-fried. Kind of too starchy for me. While I am still on sausages, this contains alternating pieces of cheese-filled sausages and teokbokki filled beef on the same stick. Don’t freak out. 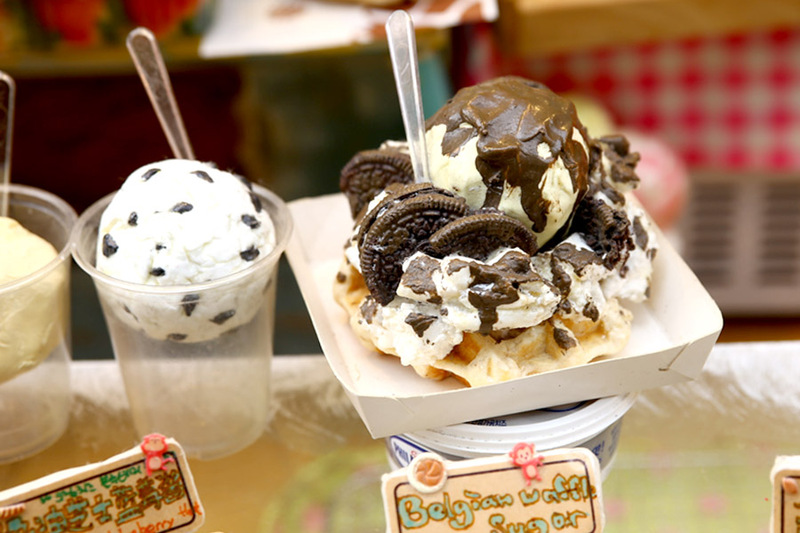 Sundae are made by boiling or steaming cow or pig’s intestines that are stuffed with various ingredients – including coagulated pigs blood with glass noodles. Unagi? 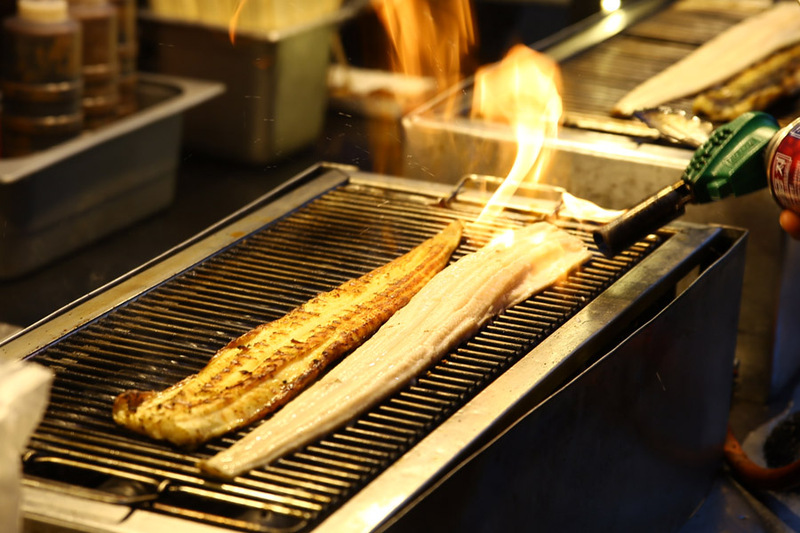 The eels with bones removed are first broiled under high heat then grilled for better texture and colour, marinated in a sweet savoury sauce. 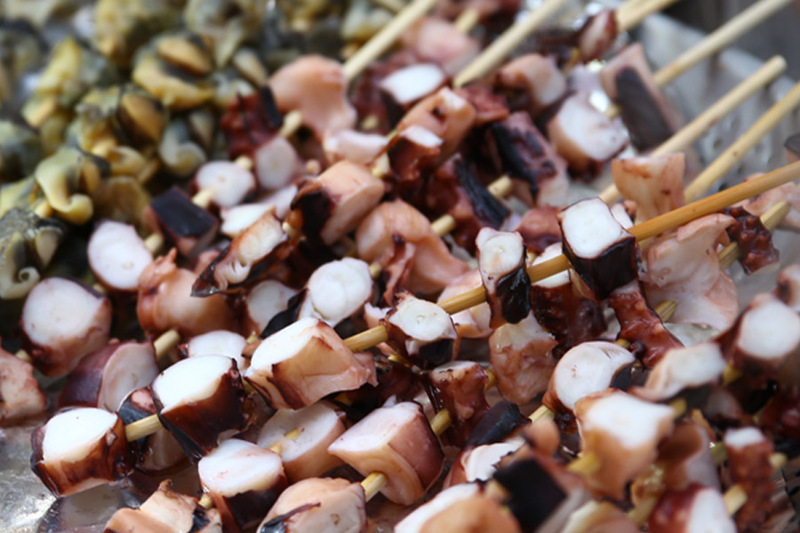 Octopus tentacles are cut into bite-sized pieces, steamed then skewered. Steaming retains the natural, fresh flavours and bouncy texture. 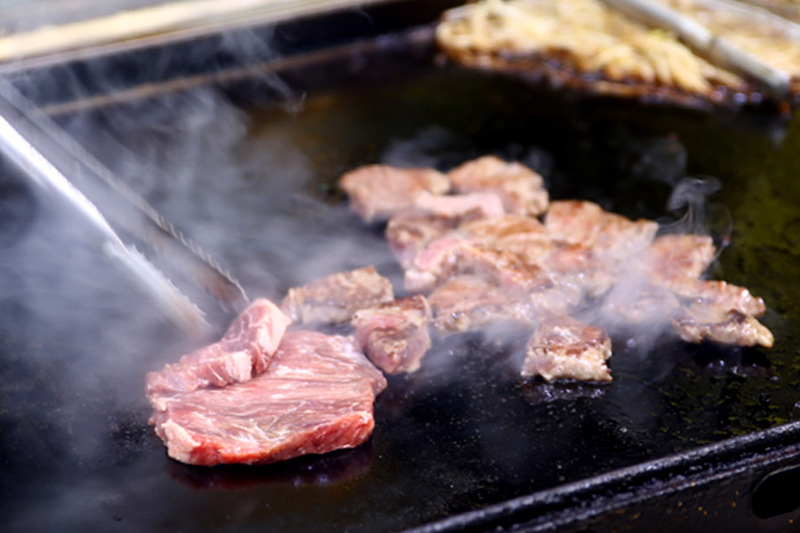 Often cooked bulgogi steak in which the meat is seasoned with sesame and scallion, using a ‘bulgogi’ sauce in the marinade for that characteristic sweetness. 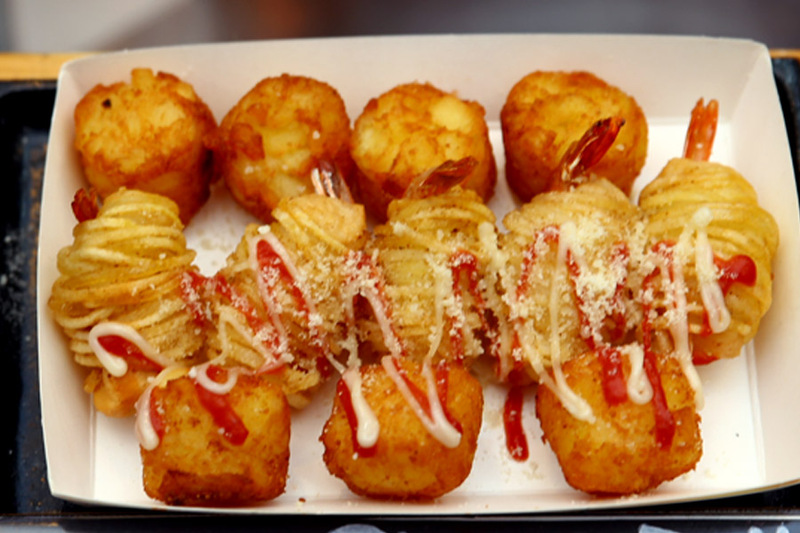 The youth Koreans love everything-cheese, so it is not surprising to find these deep-fried shrimp rolls filled with creamy cheese within. 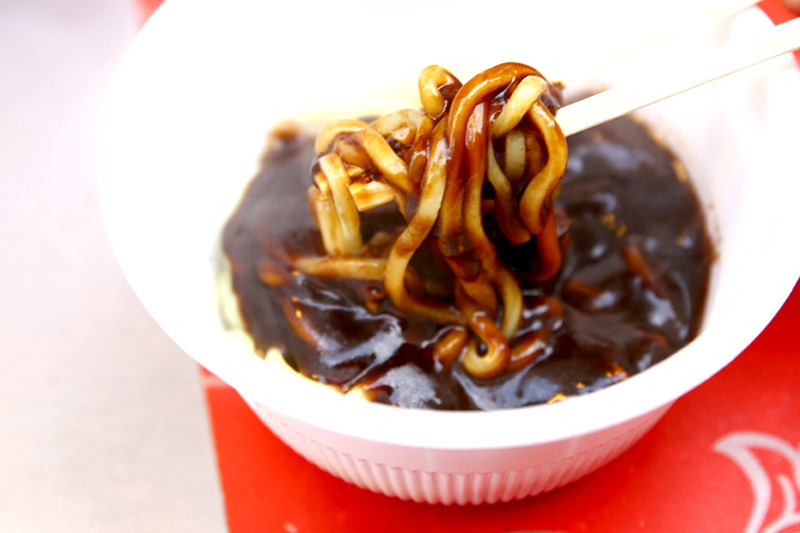 Jajangmyeon is a Korean-Chinese noodle dish topped with a thick sauce made of chunjang (a salty black soybean paste when unheated), diced pork and vegetables. Liked the sauce of this stall – deliciously spicy! I have the feeling this is made for Instagram. Just kidding. 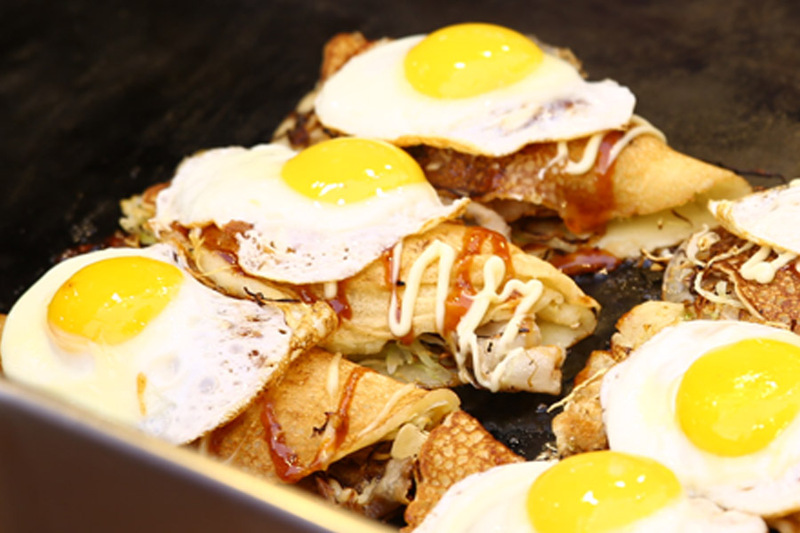 Fried pork belly (taste almost like bacon) or chicken with cabbage, wrapped in a pancake, then topped with sunny side. Warning: Consumption may be messy. 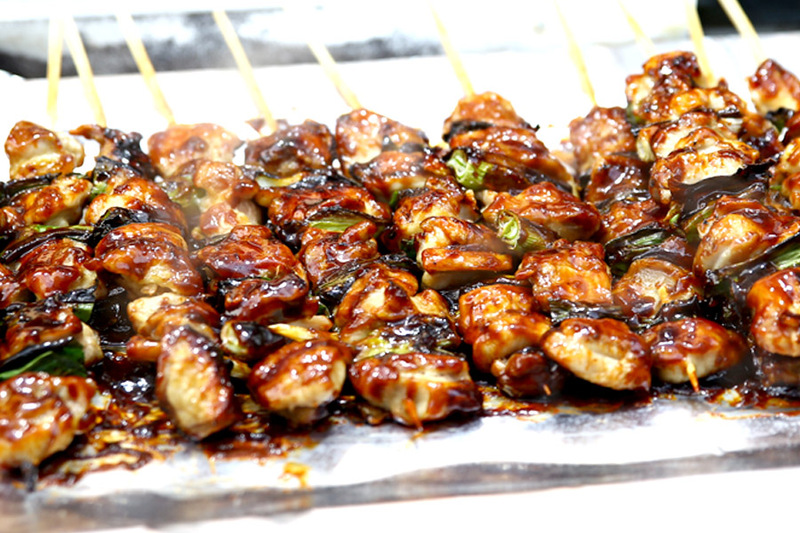 A type of Korean chicken kebab served on a stick. 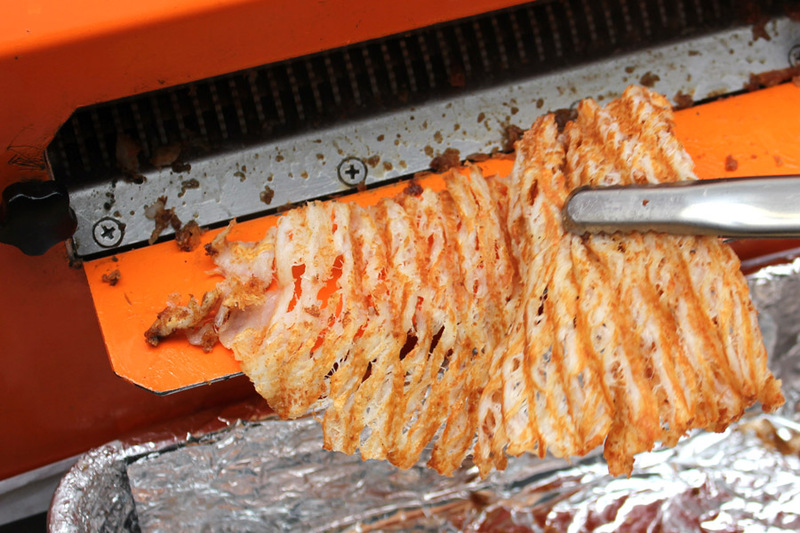 The meat is cut into narrow slices, grilled, then brushed on with spicy-sweet sauce. 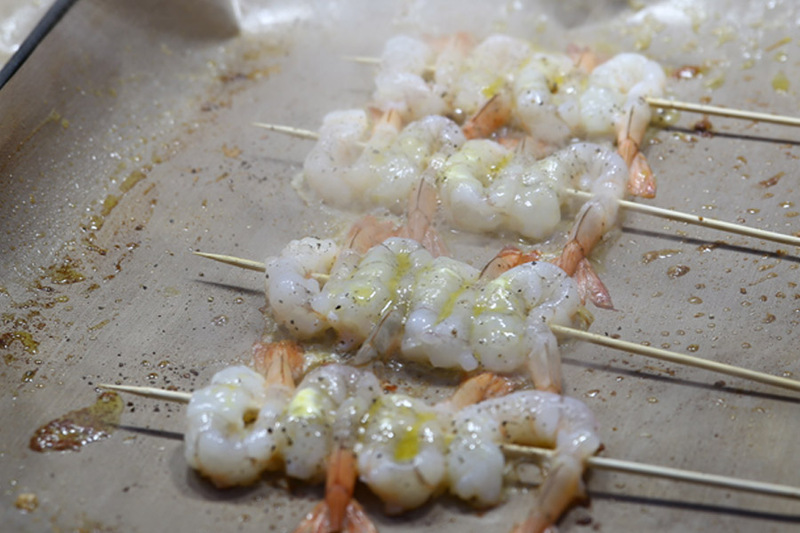 Like tempura prawns in a stick. Similar to above, but grilled in butter. 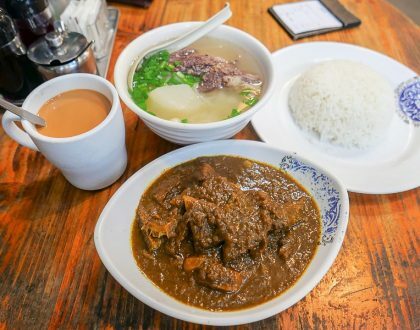 A popular winter food. 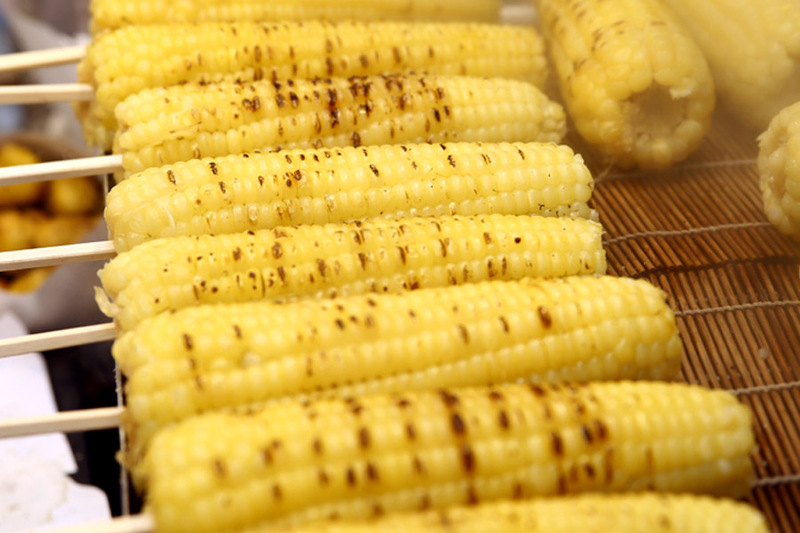 Some of the corns are just steamed sans any salt and butter, but still taste fresh and sweet because they are from the local farms. Sometimes butter and honey are added. 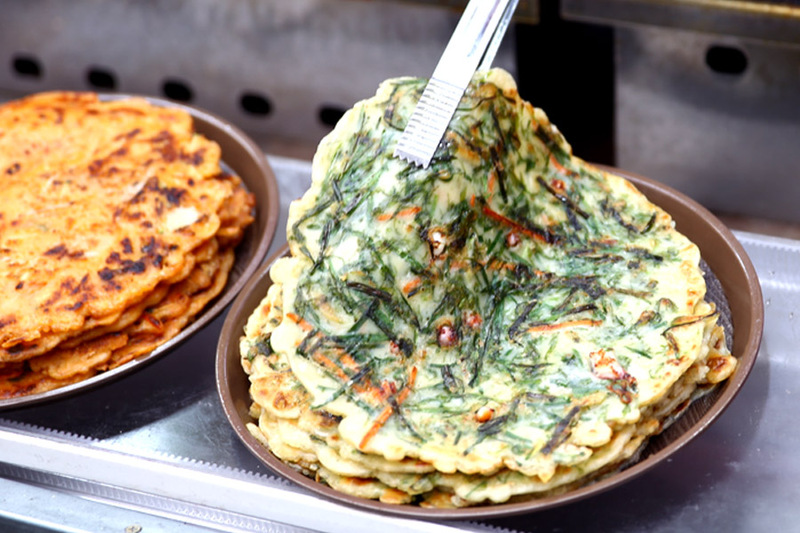 Koreans love their sweet potatoes, and you can find them in anything from latte, to cakes. 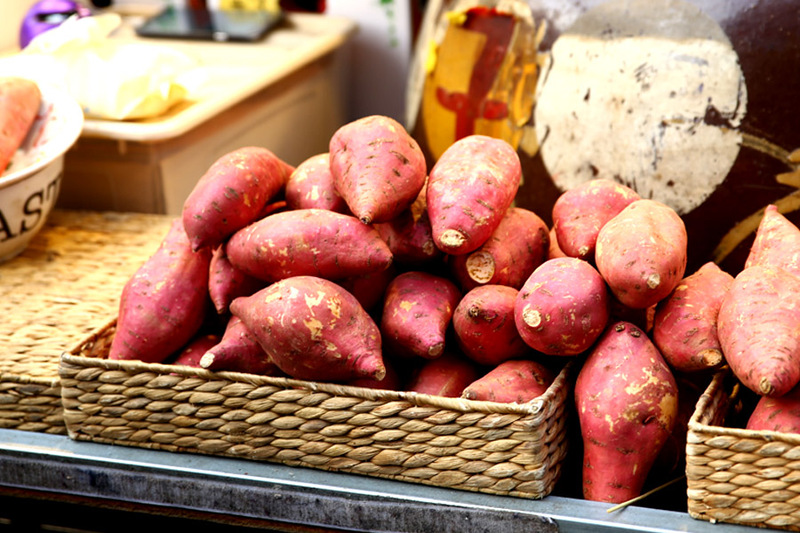 During winter, the simplest and most comforting way is to have a hot piping and soft roasted sweet potato. Otherwise, have then candied and sweet, called Goguma Mattang. 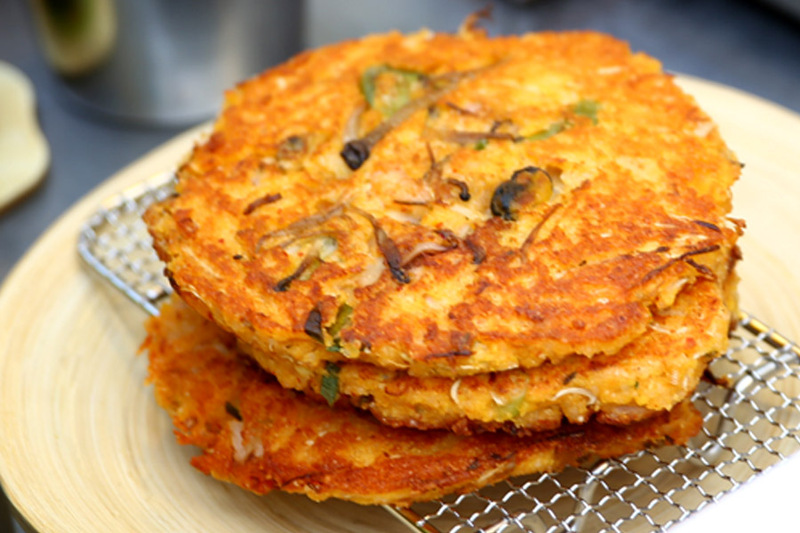 Korean mung bean pancakes are packed with ground mung beans, and other possible ingredients such as rice, kimchi, pork, vegetables, and egg. Buttery, thick, soft and fluffy, often served with ice cream and whipped cream. 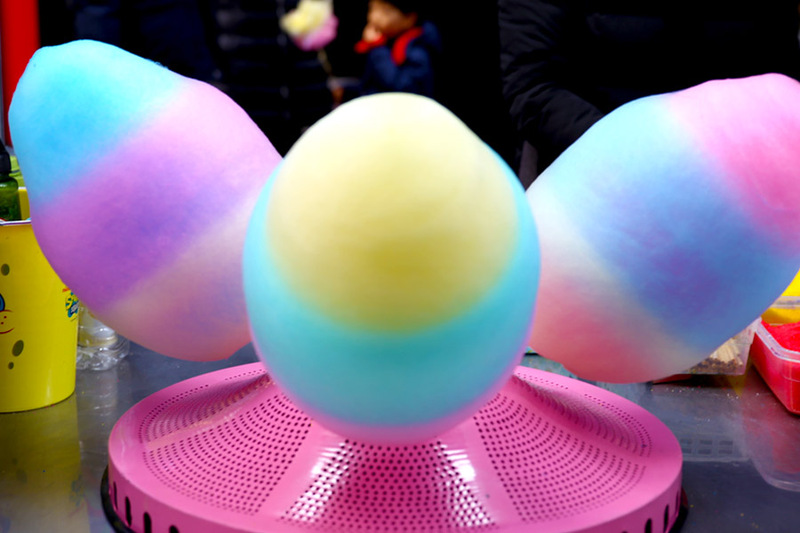 Putting cotton candy on top of desserts or coffee is a food trend in Korea, so it is not difficult to find large, fluffy, multi-coloured cotton candy stalls. Not only the children, adults buy them all the time. 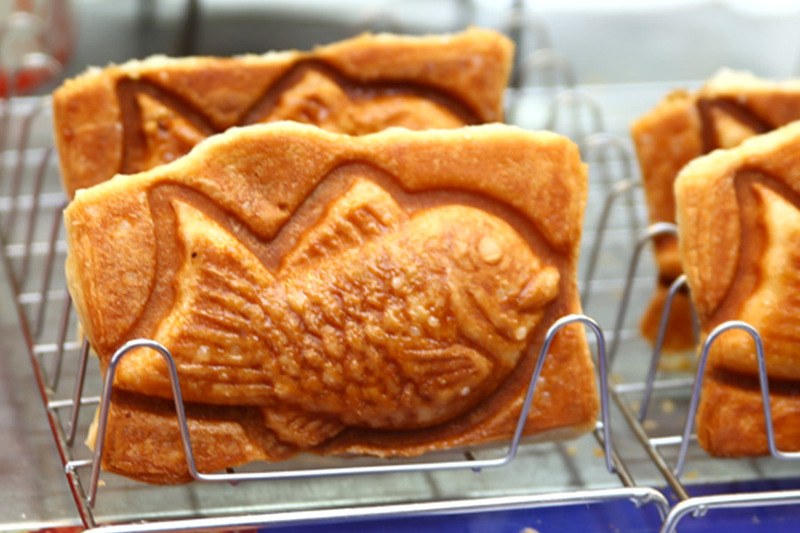 Bungeoppang or Boong-uh ppang is called ‘goldfish bread’, a pancake typically filled with red bean. Somewhat like the Japanese taiyaki. A croissant version has a flaky patry dough. 32 cm TALL! And cost only 2,000 Won (SGD$2.40). 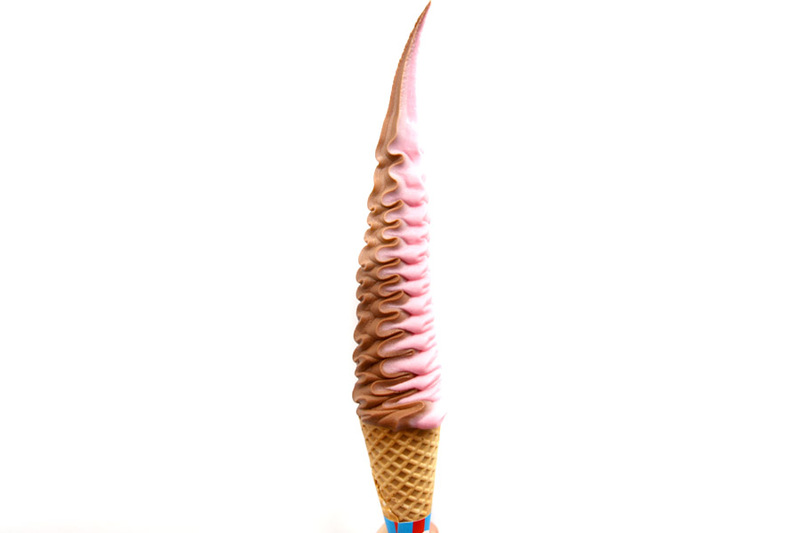 They come in twist flavours of say Chocolate and Vanilla, Greentea and Vanilla or Strawberry and Yogurt. 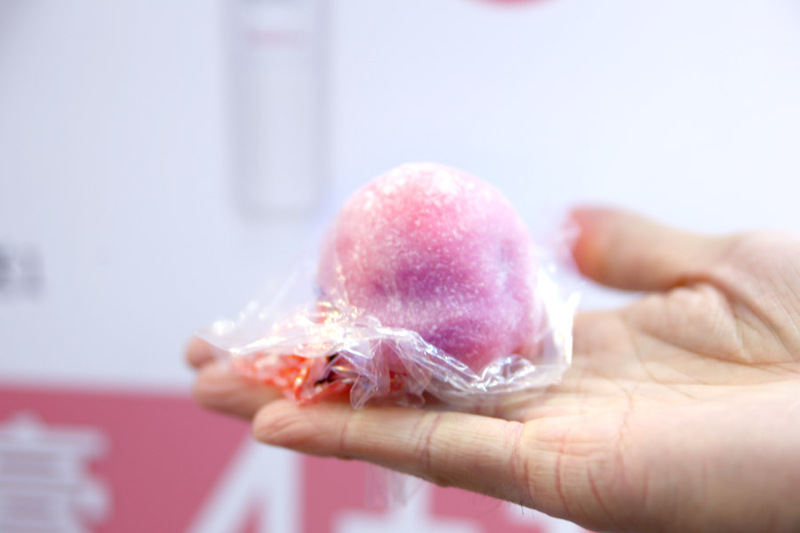 Like the Japanese’s Ichigo Daifuku, fresh strawberries are wrapped with mashed red ban, and glutinous rice flour on the exterior. Sweet, sticky and refreshing. 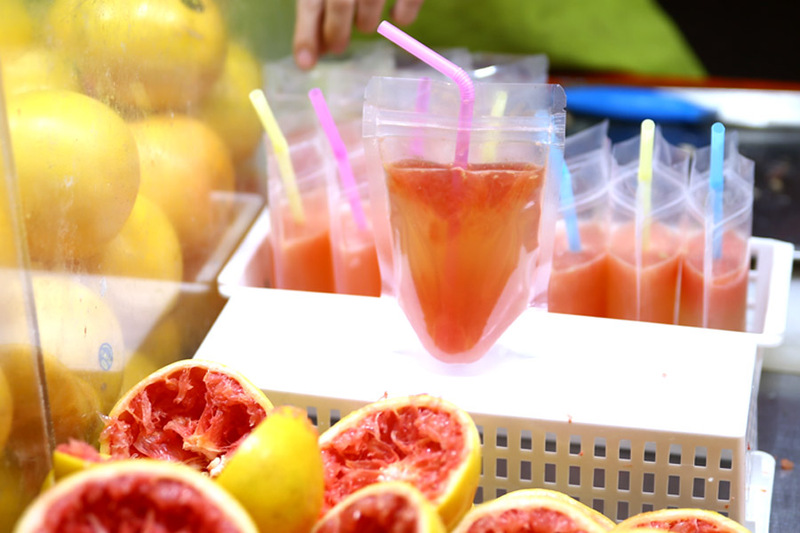 Freshly squeezed by a juicer on the spot, without the hassle. 5,000 Won (SGD$6.00). Juice with high levels of antioxidant and helps clear up the skin – why not? I used to see pomegranate juice stalls quite frequently, but Grapefruit Juice stalls at Myeongdong are my first this year. Rich in vitamin C, with sweet-sour taste. 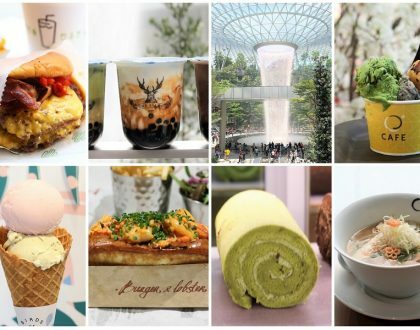 * Follow @DanielFoodDiary on Facebook and Instagram for more food news, food videos and travel highlights. Daniel’s Food Diary pays for food reviewed unless otherwise stated. wow this is really comprehensive. 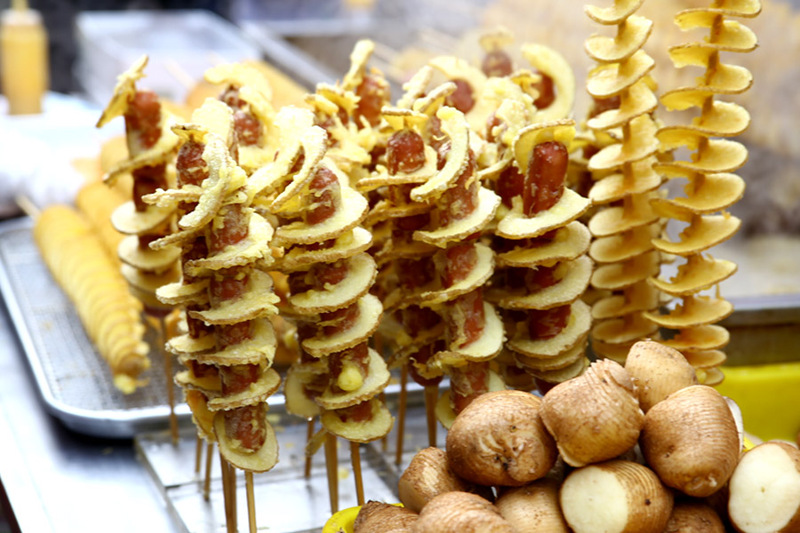 I have been to Myeongdong so many times but I never realised there were so many different types of street food. Must try them next time. I didn’t know there were THAT many until I really counted, photographed and ate the different ones I saw. I have the feeling summer will be a totally different thing. 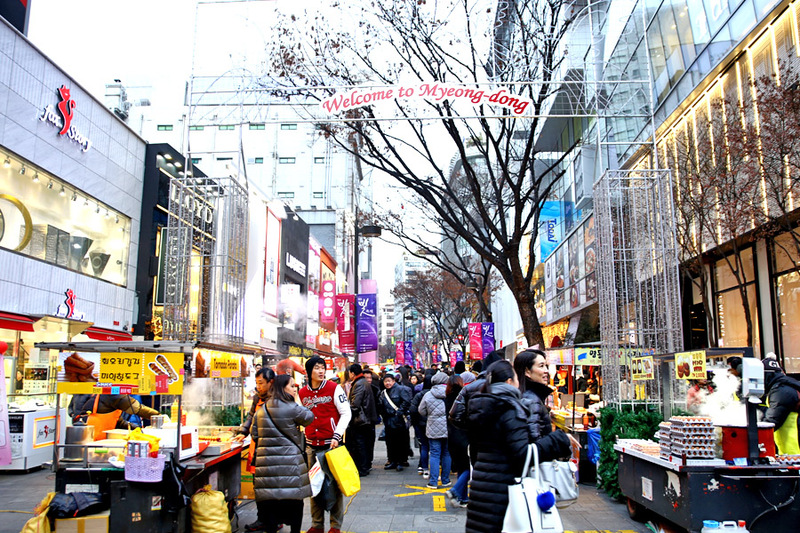 Do you know what time food stalls in myeongdong open and close? Trying to determine if we can go there for breakfast during our trip. 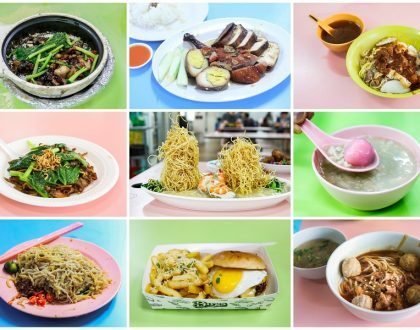 Most of the stalls open during evening times, say 5pm onwards. Hi, I saw your pictures and maybe would like to ask if I can use them for a magazin? I’m a design student and need to make a magazin for my school aber countries. Please contact me on my e-mail to tell me if its ok for you. Hello, I just read your blog and i feel so interested with Korean food. I know a little bit about korean food just by watching korean dramas. After I read your blog, now, i know more about kind of korean food. 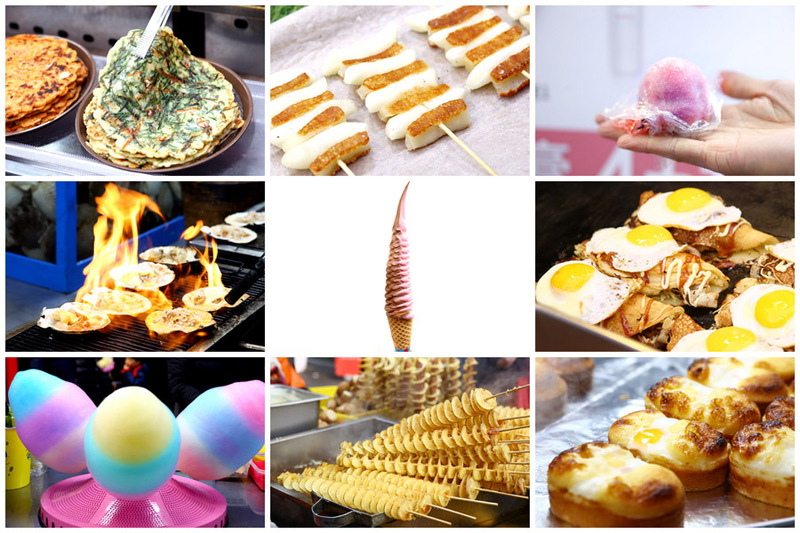 Your blog is really helping travelers who want to go to Korea but they don’t know about Korean food, it can help them to find Korean street food there. stall open at 5pm but will tehy be open till late? my flgiht arrives at 9.30pm and will liely be about 11pm before we get to myeongdong, where our airbnb is. Willthere still be much food places around?